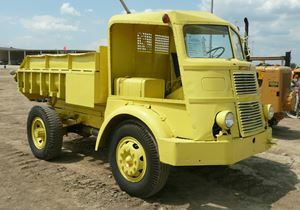 Charles Casturo owns this little Diamond T dump truck, a model 614-S built in 1939.
Who needs an EROPS? The fellow taking this Cletrac FGC to the loading dock is enjoying natural air conditioning. This is another of the Schaaf Museum exhibits. 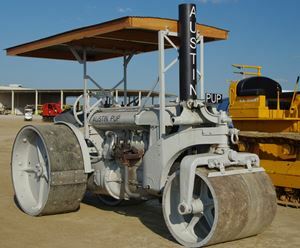 Tractors of all sizes were shown by the Schaaf Museum. 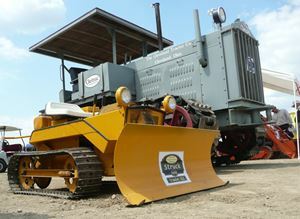 A 1970 Struck is dwarfed by a 1927 Cletrac 100.
dirtmoving in the pit. Its name, The Twins, alludes to the TC12’s famous Twin-Power power train. 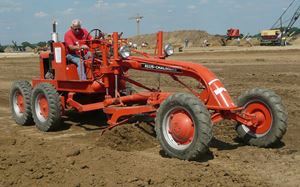 The Cletrac 100 got its model designation from its drawbar horsepower rating. They were built from 1927 through 1930, and are quite rare today. The Schaaf Museum showed this example. 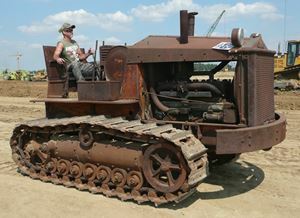 conversion of a Fordson tractor, restored and shown by Evan Gooch of Columbia, Tennessee. 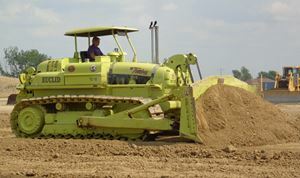 The P & H S-20 Stik-Clam was produced decades ahead of today’s compact excavators. 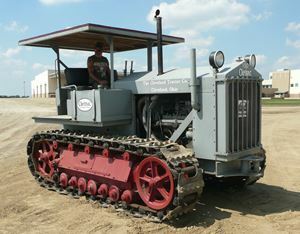 Board Chairman Dave Geis of Seward, Nebraska, owns this example, built in 1962. 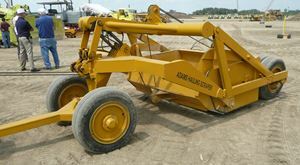 1938 Adams S3 Hauling Scraper, owned by Dave Geis, Seward, Nebraska. 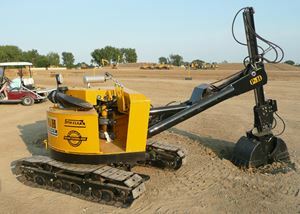 grader are working hard to keep up with the Bowlbusters scraper fleet.